Share the post "Recent Visiting Fulbright Scholar at Rutgers Fulfills Dream of STEM Education for Girls in Nigeria"
Folasade Olajuyigbe, standing eighth from left, with the six awardees and their parents, and other attendees at the award ceremony in October at the Federal University of Technology in Akure, Nigeria. 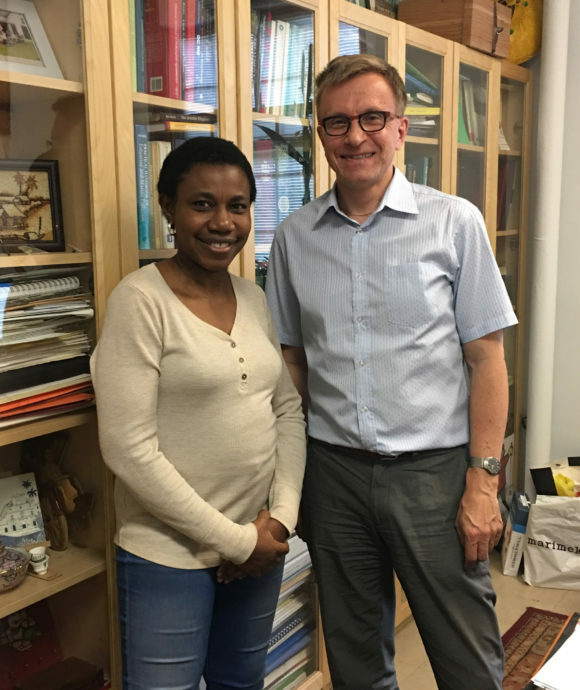 Fresh from a successful Fulbright Senior Scholar sojourn at Rutgers that ended in July this year, Folasade M. Olajuyigbe returned to her native Nigeria to fulfill a dream. Through her non-profit, Women’s Dignity Initiative Inc. (WDII), launched during her Fulbright program at Rutgers, Olajuyigbe presented the organization’s first scholarship awards to six high school girls in STEM in October of this year. Speaking on the vision behind the initiative, Olajuyigbe said that “the challenges of living in rural areas are numerous. Few who attend schools have secondary school as their ultimate goal.” Each of the awardees, selected from remote villages in Ondo State who had to successfully complete an examination administered by WDII, received tuition, science textbooks, mathematical sets and school bags. Folasade Olajuyigbe with Max Häggblom, distinguished professor and chair, Department of Biochemistry and Microbiology at Rutgers. WWDI serves middle and high school girls in educationally disadvantaged communities aged 10 to 18 in Nigeria, through teaching and empowerment programs to promote enrollment in Science, Technology, Engineering, and Mathematics (STEM) and increase participation of women in the labor force. During her Fulbright program, she worked with Rutgers faculty in the Department of Biochemistry and Microbiology, especially Max Häggblom, distinguished professor and chair, and Gerben Zylstra, distinguished professor and director of the Microbial Biology Graduate Program. Her independent research focused on the biochemical and molecular studies on aerobic biodegradation of crude oil as her Fulbright project. Olajuyigbe, who holds a doctorate in Biochemistry, is a senior lecturer in the Enzyme Biotechnology and Environmental Health Unit of the Department of Biochemistry School of Sciences, Federal University of Technology in Akure, Nigeria. Read more.